Gambia : When and where to go? 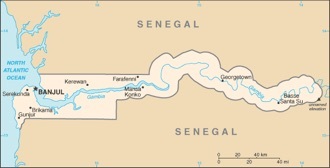 Located in an inter-tropical zone, the Gambia has two seasons, one dry season and one rainy season. The sunshine is very important. From November to May, the dry season hardly ever sees the rain, and the heat is attenuated on the coast by sea winds. Inside, the temperature can reach 40 ° C. The rainy season runs from July to September, with tornadoes, heavy rains, and lush vegetation. June and October are intermediate months, where the sun is still very present. The best time to visit The Gambia is between November and February, where the weather is dry but the temperatures still cool enough. Tiny country in West Africa, the Gambia will offer you farniente on its beautiful beaches and bird watching. Start off on the Atlantic coast to enjoy the sun and sea, then discover the market of Serekunda and the village of craftsmen of Tunbung before taking a break in the town of Brikima. Not to be missed, the Abuko nature reserve, and the beautiful island of Ginak. Also worth a cruise on the river to Janjangbureh. Bird lovers can visit the Tanji Reserve, with its multitude of migratory birds, as well as Marakissa and its wide variety of species. In Baobolong, it is the owls, the egrets and the herons that will welcome you. Note: The Gambia is a country where you can find tourist structures that celebrate both luxury and ecology. There is very little equivalent, so enjoy! A visa is required to enter the Gambia. The current currency is dalasi. If you are traveling to the Gambia by plane, you will land at Banjul airport, which is actually in Yundun, 20 km from the capital. But you can also come through Senegal. Taxis-brousses allow to reach Dakar in Banjul, which can be quite long because of the formalities. Once in the Gambia, you can use the minibuses, which circulate in rural areas, or the "large coaches", the 32-seat Mercédès bus, which is the cheapest means of transport ... but also the slowest. We also use pick-ups and seven-seater taxis, armed with patience and making a cross on its comfort. The bike can be a very good solution given the flat terrain and the short distances, and provided to be very careful. In the towns, there are horse-drawn carriages and carriages, but also minibuses and taxis. For your budget, plan about 20 € for a double room and less than 10 € per meal. Yellow fever vaccine is mandatory, and vaccines are recommended. Protect yourself also against malaria, and against mosquitoes that can transmit dengue. As for safety in general, beware of tides that create strong currents that can take you offshore. Jellyfish are quite common. For the rest, pay attention to the pickpockets, and avoid approaching the military installations. Keep prescriptions that accompany your medications to avoid being charged with drug possession.